You'll be £17.50 closer to your next £10.00 credit when you purchase Ribbons Among the Rajahs. What's this? Order within the next 6 hours, 57 minutes to get your order processed the next working day! From the mid-eighteenth century onwards, British women started travelling in any numbers to the East Indies, mostly to accompany husbands, brothers or fathers. Very little about them is recorded from the earlier years, about the remarkable journeys that they made and what drove them to travel those huge distances. Some kept journals, others wrote letters, and for the first time Patrick Wheeler tells their story in this fascinating and colourful history, exploring the little-known lives of these women and their experiences of life in India before the Raj. With a perceptive approach, Ribbons Among the Rajahs considers all aspects of womens lives in India, from the original discomfort of traversing the globe and the complexities of arrival through to creating a home in a tight-knit settlement community. It considers, too, the effects of the subservience of women to the needs of men and argues for the fusion of European and Indian cultures that existed before imperial times. Throughout this book there are liberally scattered quotes from letters, journals and other writings of women who undertook this great adventure of seeking a new life in India, and this for me is the greatest achievement Patrick has made with this book due to the diligent research it must have required. It means the book can provide a framework for the historian wanting to learn more about the social history of the British living in India, with frequent input from primary sources, which really brings the whole subject to life. The fact that the whole book does this from the perspective of women is a breath of fresh air and means there is value in reading this book even if you have already gained a solid understanding of life of the British in India from elsewhere. Patrick also provides a comprehensive bibliography for those who wish to investigate further. I think this book will find most use in the hands of someone interested in social history of British India before the Raj (especially if they’re interested in the women) or for family historians who are wanting an insight into ancestors who may have lived in India. Even before the Raj, many Europeans settled in India. Patrick Wheeler evokes life for upper-class women there, from struggles with heat and social protocol to a surprising sympathy for Indian culture. Extensive quotes from letters tell the women's story in their own words. The writing is in-depth enough to interest those with some background knowledge but not so difficult as to put off casual readers. Themes, such as the changing attitudes to Indians, and the fears of life and death, run through each of the chapters and tie the book together. The bibliography is extensive and useful. There are some reproductions of images from the time, especially those painted by the women who’s journals and letters were used, included, which give us some idea of the clothes worn and environment they lived in. Wheeler tells of the voyage, household, matchmaking, domestic duties, and entertaining by British women in India between 1857 (the first Indian war of independence) and 1947 (the time of India's full independence) through the letters and diaries of the women themselves. 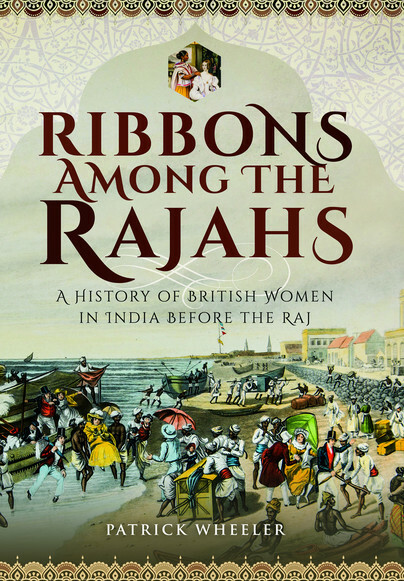 Ribbons among the Rajahs is a fascinating account of a largely unknown or forgotten aspect of the British period in India, namely the lives of European women. Patrick Wheeler’s starting point was when researching a family forbear he found virtually nothing about the life of his ancestor’s wife. This has led to an extremely readable and detailed account of the mainly British women in India before the Indian Mutiny of 1857. He has done an incredible amount of painstaking research and uncovered many diaries and letters from these women and has woven this information into an well woven account of their lives. Wheeler deals with all aspects of life from the voyage out to India, their arrival, settling in and getting used to the sometimes strange aspects of life in India, social life, the daily routine, leisure activities and interaction with others, both British and Indian. One of the sobering facts is that for almost all the women travelling to India it was a one-way ticket, with death often at a relatively young age from illness or childbirth. The journey itself for a single women could have cost an astronomical £15-20,000 in today’s money and was generally arduous, taking somewhere between four and five months on an East Indiamen. The baggage allowance of 1-2 tons may seem generous but the list Wheeler includes of ‘Necessaries for a Lady Proceeding to India’ makes fascinating reading. One interesting aspect of the era as detailed by Wheeler from his research is the much greater interaction or seeming equality with Indians (or at the very least tolerance and understanding of the Indians and their way of life) in the pre-Raj era than most readers will recognise from The Jewel in the Crown and similar Raj-era films or TV shows. Children born in India often became fluent in the language and quite Indianized. As Wheeler points out all this began to change “with the growing evangelism of the early Victorian era, as well as a parallel [political] encouragement towards greater British hegemony”. The Christian proselytisers of the era were going to great lengths to convert Indian souls to Christianity, partly in the belief “that they were improving the wellbeing of a primitive society”. What started out by Patrick Wheeler as a genealogical investigation has turned into a very well crafted and interesting social history of the period which is thoroughly recommended. There is also an extensive bibliography. Patrick Wheeler graduated in Medicine from Oxford before embarking on a career as a specialist Physician in hospitals in the southeast of England. Some time before he left medicine he had developed a great interest in India, and especially its colonial history. Working with people has particularly inclined him towards social history, Ribbons Among the Rajahs is his first book.